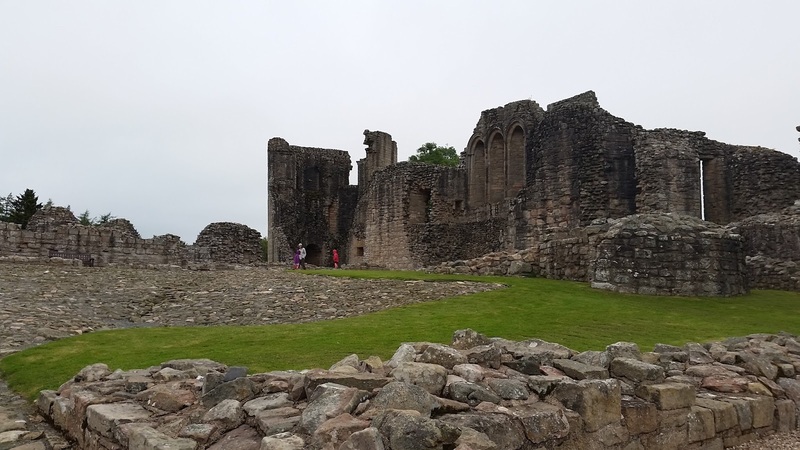 We recently returned from two weeks spent in glorious Scotland. We had a wonderful time; and to their credit (considering the trans-Atlantic flight, time spent driving around, and amount of "poopy mommy stuff" they had to do), the girls did very well. We invited ourselves onto a trip that my mother and sister had been planning for years... so the girls and I were traveling with Mommy, Renata, and my brother-in-law, Brian. A nice 2-1 adult/child ratio. We flew out of Dulles, had a brief stop in Iceland, and then continued on to Glasgow. Icelandair might not be generous with food and drink, but they were very helpful with the girls... giving them travel packs with earphones, blankets, and coloring sets, and also free food and drinks. This is perhaps the one time Renata wished she was still a kid. The first day was a bit tricky because we couldn't seem to find anything we were looking for... including our hotel and our dinner. And we were all exhausted from the flight. 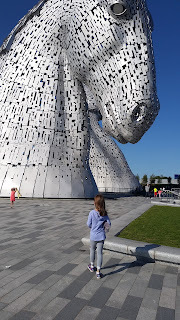 Eventually, we made it to Falkirk and the Kelpies, and had a beautiful walk around. 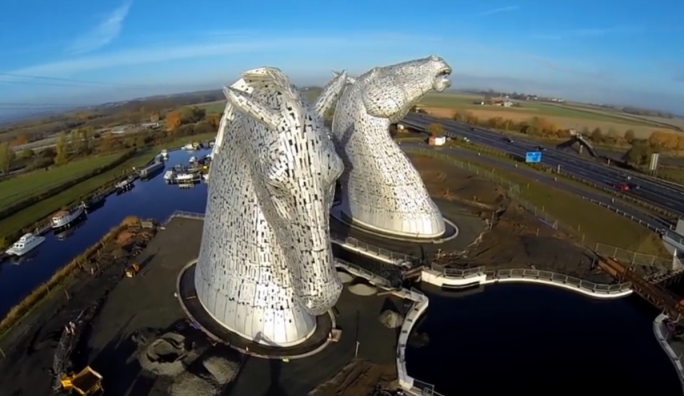 The Kelpies are a tribute to the role of the horse in shaping modern Scotland, and they are incredible. Nearly 100 ft tall, they dominate the landscape! After a coma-like sleep, we were ready to hit the roads and see the sights! 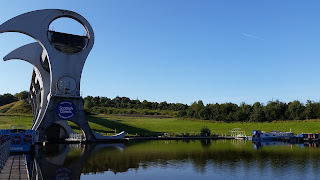 The first stop was the Falkirk Wheel, another impressive feat which is part of the canal system that transverses Scotland. We didn't take a ride, but we spent some time with the excellent kids area that had wonderful examples of ways to move water! You know I can never turn down a chance to make the girls learn something! 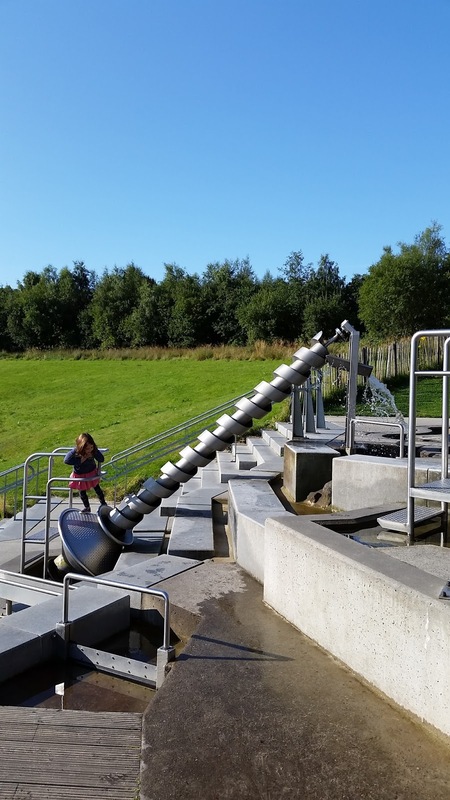 They even had an Archimedes Screw! Then we were off to the races! Literally. 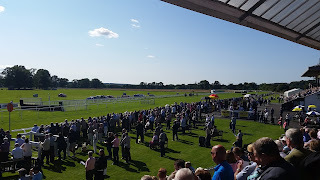 We headed toward Perth, toured Scone Palace, and went to the Perth Racecourse for the Scotland Food and Drink Festival. 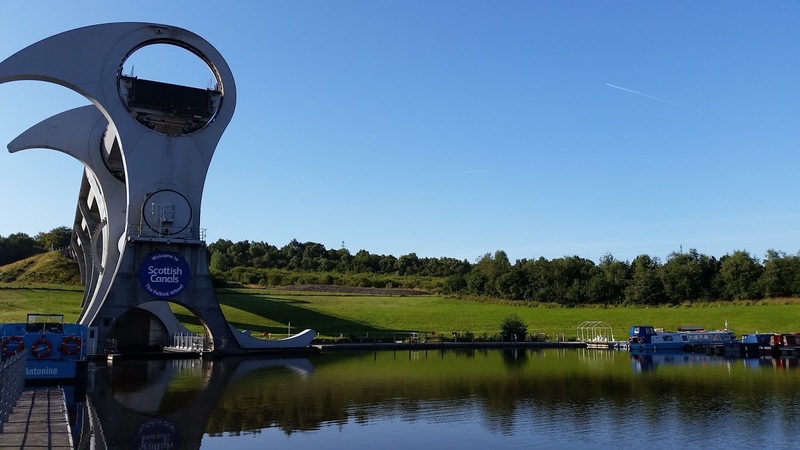 We dined and sampled beers and then tried to find any available shade as it was a glorious day, and much warmer than Scotland has a right to be. It was fun to watch the races, and Cora even picked the winning horse in the second race! 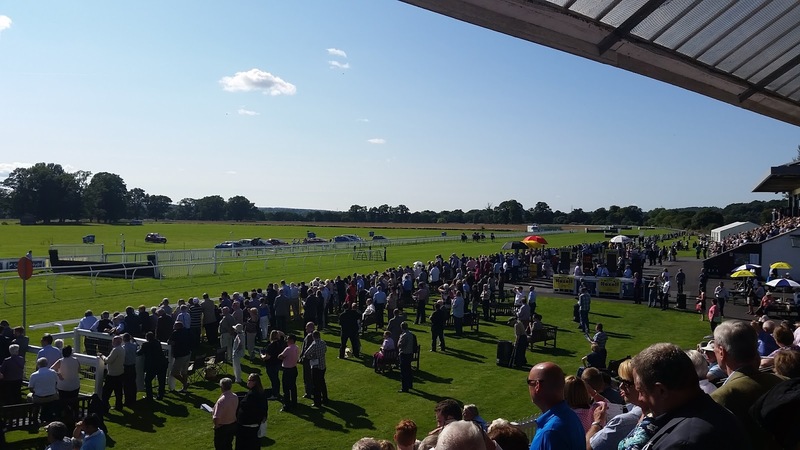 A hot afternoon at the races! Our hotel that night was right in the middle of Perth, but it was next to a park and had a lovely beer garden. We took full advantage and just enjoyed the afternoon, and some delicious Scottish beverages. The next day was to be our longest day of driving, and my worry about going the wrong way didn't make it easy! The scenery was grand though! We had grand plans to see many castles, but I think we only managed to squeeze in one. We went by Balmoral, but it seems that Elizabeth II doesn't like American tourists poking around while she's on holiday. 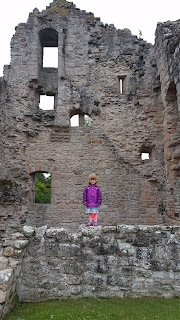 We made it to Kildrummy Castle, a 13th century ruin, which is one of the largest ruins I have ever visited. This was a pretty trying day with the girls... the third day of our trip (the worst for jet lag in my experience), Cora got car sick, and everything seemed to be closed. So, the other adults escaped into the Glenfiddich Distillery and the girls and I headed onto Inverness. On Wednesday, we poked around Inverness for a bit... but Marks and Spencer's grocery section was where we had the most fun! Then we headed south towards our next destination. 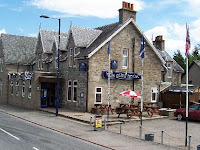 We were traveling through a part of Scotland I have been in many times, and I decided to stop at one of my favorite places, the Glen Hotel in Newtonmore. Mommy, Renata, and I had a Mother's Day lunch there many years ago; and when Tony and I were in Scotland last, we stopped there to spend a night. All I had to do was walk into the pub to realize it was the same place (apparently I never forget a drinking establishment). We had a great lunch there... I'll have to keep up the tradition of going there! That afternoon we arrived at the little cottage outside Kenmore where we would be staying the next five nights. The first order of business was riding lessons for the girls. They loved it! 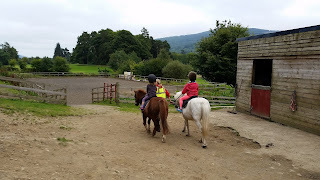 Their instructor was great, and she had them on ponies and whisked away very quickly. When they returned, they were all smiles and they played a few games before saying goodbye to Manhattan and Taffy. 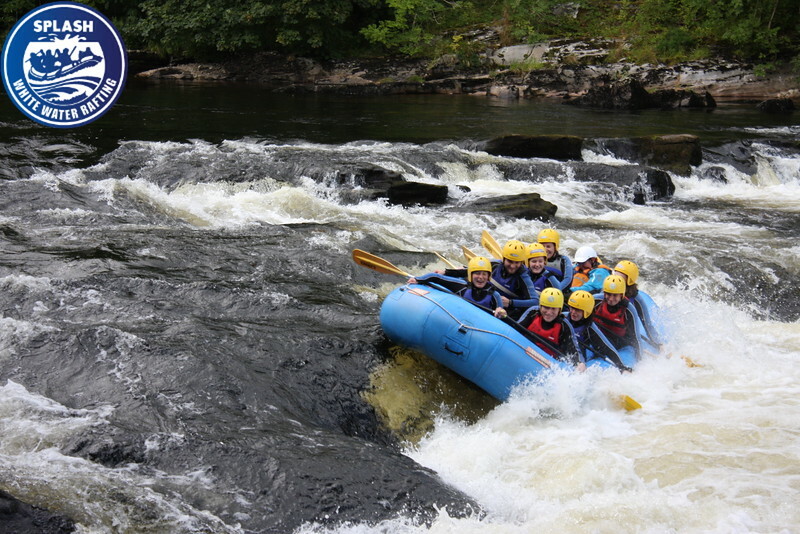 The girls would probably say that was one of the best parts of the trip! 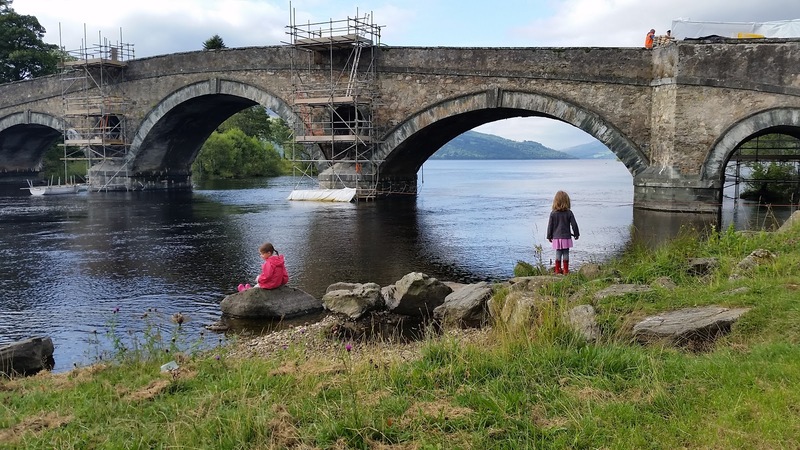 The cottage was at the Mains of Taymouth resort, and it was a perfect base for us for the next few days. We had a lovely back garden, plenty of bedrooms, and even a pool table to keep Renata and Brian occupied. The next few days would be spent at the FEI European Eventing Championships at Blair Castle. Mommy and Renata had been planning to attend the Championships for years... Brian, the girls, and I had just jumped on the bandwagon! 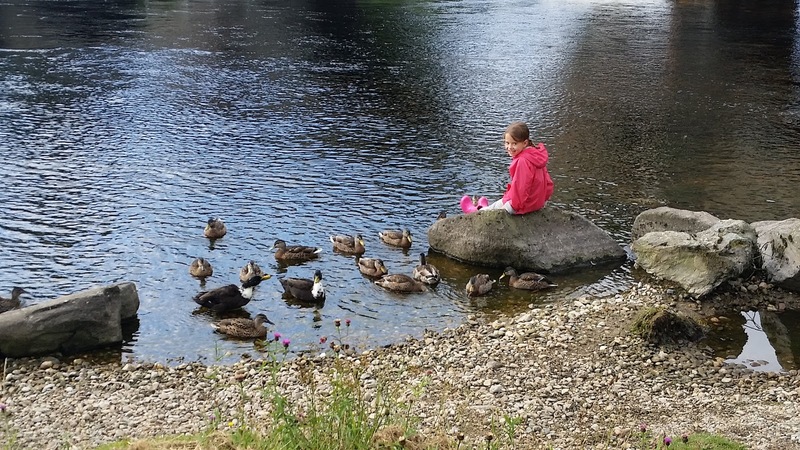 Thurday morning, the girls and I headed out to feed the ducks along the River and Loch Tay. It was a gorgeous morning, and the girls were quite content to splash about in the river and command the attention of 20 or so ducks. 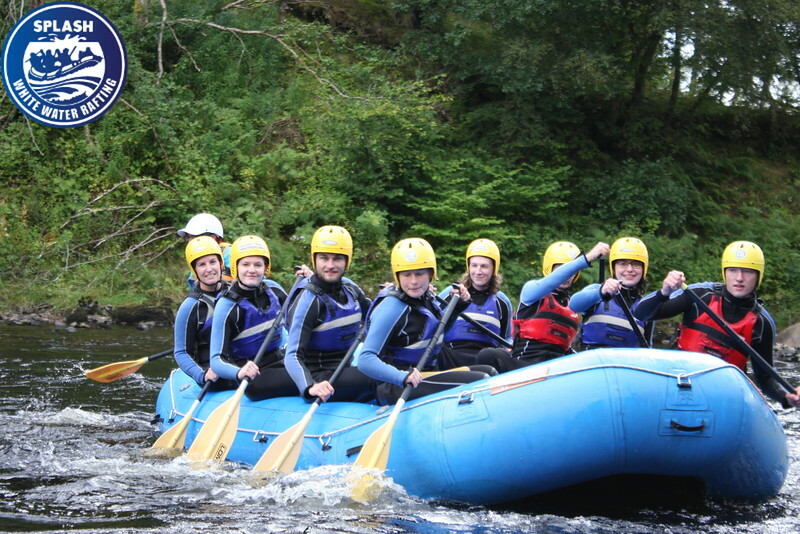 That afternoon, Brian and I went white water rafting on the Tay. He was the only one brave enough to join me, so Mommy and Renata took the girls to tour Blair Castle. We had a great time! It was a great way to spend the afternoon, and I was ready to do it again the next day! It was also an excellent reason to have a pint down the pub afterwards! Friday the girls and I went to Blair Castle on the heels of Mommy and Renata. It was my first exposure into a major eventing event (haha)... lots of tweedy people walking around, loads of good food, shopping, and a kids area that immediately attracted attention. 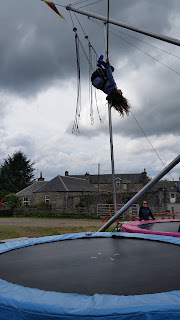 We tried one of the bouncy houses and the trampolines, which the girls enjoyed immensely. That evening, it was wonderful to welcome the extended Moffat clan to our cottage (more on them later). 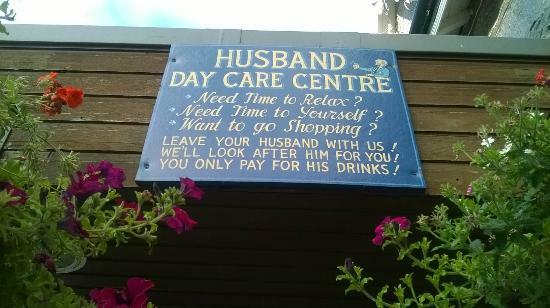 I thought I was quite posh by waiting for them on the stone wall outside with a glass of wine and a plate of chips... I am not sure wine and chips are a posh combo though. We had a great evening with them, and even made an impressive dent on the massive bowl of chips we had! I'll have to pause at this point... this is fairly lengthy already... stay tuned for the next installment... "When we nearly got hypothermia in September!" I think (I haven't actually bothered to check) that a lot of my recent posts have been about the up and down, and round and round feelings I go through all the time. It might make for monotonous reading, but it takes up most of my time. I've decided to coin a new term for this feeling: widow-lescence. It reminds me a lot of the turmoil of being a teenager... the doubt, the anxiety, but also some shining moments of joy. Just as adolescence is a journey we all must take to emerge into the adult world, I know I must go through this in order to re-emerge into a world without Tony. It's something very difficult, and something I can only go through alone... I will say that I'm thankful that there is less acne in widow-lescence. So, bear with me as I learn how to be a person again... a phrase that I hear so many parents use when their kids emerge from adolescence. Also, I promise an excellent travel post soon! We met about 5 weeks after that day. I would never seek to diminish it; but tonight, all my ugly crying was for you.